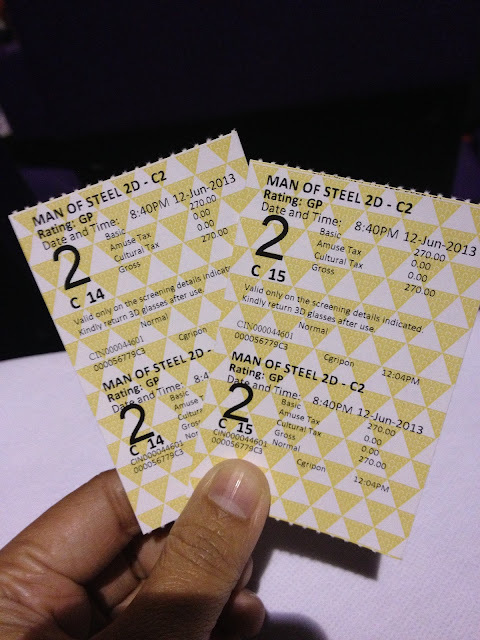 Man of Steel opened last June 12, 2013 here, I was lucky to score some tickets to catch it on the premier. I won two movie tickets for the viewing at Resorts World Cinema, courtesy of a post I made for Nuffnang and Wacoal. I didn't know what to expect from the movie since I cannot recall the last time I saw a superman movie ( I didn't watch Smallville and I know, I'm lame). I wouldn't be writing spoilers about it here. It's best to see it for yourself and judge. After 2 hours and more of ooohh's, ahhh's and awww's, I was amazed. The movie was so good that I can't believe that it was that long. The fight scene kind of got most of the hours on the movie because it was tad too long. I realized it after my bladder was already screaming and fight was just warming up. The effects and sounds were amazing that one would not realize that it was that long. Another thing to watch out is Henry Cavill because he is ultimately an eye candy. The solid hard muscles and abs, chiseled jawline and deep blue eyes got me all lost. It's been a while since I was on fan girl mode, up until this. Overall, It was great! The movie did not disappoint. I need not to stress it out because it is inevitable, hitting box office on its first week here, and seeing most cinema houses are full with man of steel screenings.